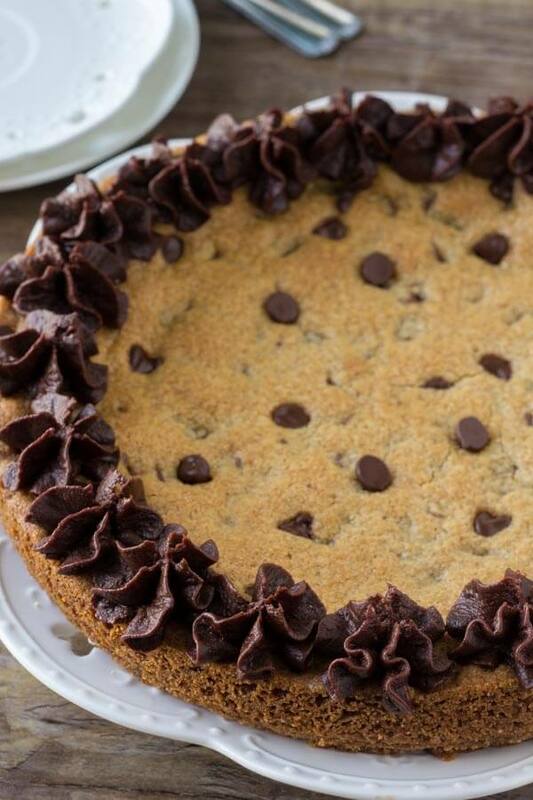 My favorite type of cookie – my favorite type of cake. 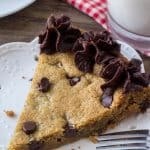 This Giant Chocolate Chip Cookie Cake with Chocolate Frosting is the ultimate dessert for cookie lovers. 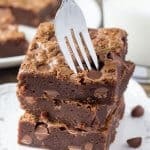 If you like giant chocolate chip cookies that are extra soft, super chewy, and maybe even a little gooey – then this cookie cake is for you. It’s probably my favorite thing in fact. My my raison d’etre if you will. Because we’re combining cookies, cakes & frosting all in one – and the recipe is so easy. It’s the perfect birthday cake for cookie lovers, or when you’re looking for a no-stress recipe. The cookie is super soft & buttery. And because its made into cake form, there’s no need to chill your dough or form all those little cookie dough balls. What’s even better about making cookies in cake form is that there’s no dough chilling. So it’s super quick and easy to make. AKA – if you’re watching Netflix by yourself on a Saturday night and the craving hits…. well, you know. Finally, I piped chocolate buttercream around the edges of my chocolate chip cookie cake. It’s also delicious served warm with ice cream, or maybe a drizzle of chocolate sauce. Or all three. 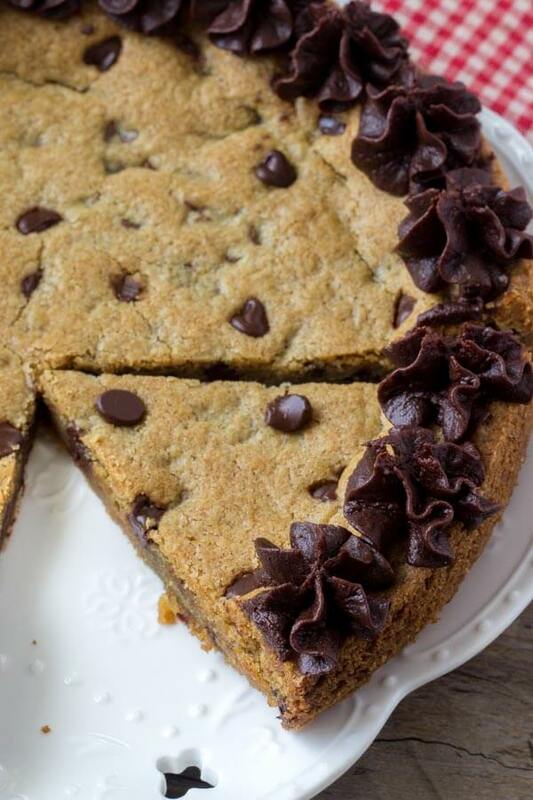 A super soft & buttery Chocolate Chip Cookie cake filled topped with creamy chocolate buttercream. 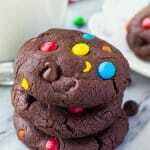 The perfect recipe for cookie lovers! Spray a 9 inch pie pan or 9 inch round cake pan with non-stick spray & set aside. In a large bowl whisk together the flour the flour, baking soda, pudding mix & salt. In a separate large bowl beat together the butter and sugars on medium speed until light & fluffy. Mix in the flour mixture, followed by the milk. Turn off the mixer and stir in the chocolate chips. Spoon the mixture into your prepared pan & press down the cookie dough. Bake for about 25-30 minutes until the top looks set. If the top starts to get too brown before the cake is done, tent a piece of aluminium foil and place it over the top. Remove from the oven & allow to cool on a wire rack. In a medium bowl beat the butter until fluffy. Beat in the cocoa powder. Then beat in the powdered sugar about 1/2 cup at a time, alternating with 1 tablespoon of milk/cream until the right sweetness level is reached. Decorate the cake and serve. *If you don't have any vanilla pudding mix, add 3 extra tablespoons of all-purpose flour plus 2 teaspoons of cornstarch. **Leftovers can be stored at room temperature in an airtight container. Omg this looks amazing! Next cheat day I am treating myself to this. Maybe I’ll share…maybe. I would highly recommend having that cheat day soon! Thanks Tien! Good luck with the giveaway!! This looks divine! Not like those flat overly sweet cookie cakes you can buy in the grocery store. 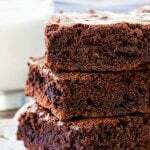 Wish I could have some right now! Thanks so much Lindsey – thick & chewy cookies > than store bought any day! My husband loves those giant cookie cakes you buy at the store, but they’re gross. I’ve yet to try a homemade one… maybe this time!! This one is soooooo much better than the store bought. Good luck with the giveaway – and I hope your husband & kids like the cookie cake! I only have chocolate pudding mix…Will that be ok? I think it’ll work. 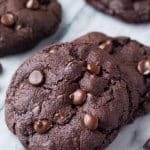 The cookie will just have a light hint of chocolate and be a little darker in color.